LOCAL pharmacy services have been brought bang up to date with more choice and flexibility available to residents, while at the same time saving the NHS valuable time and money. Founded in July 1948, over the past 68 years many NHS services have changed beyond recognition but the three core principles remain: that it meets the needs of everyone; that it is free and that it is based on clinical need, not the ability to pay. 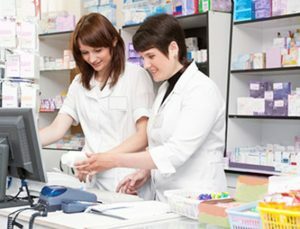 Although strictly under NHS contract, most pharmacy services are provided by individuals or companies. Pharmacy is now managed centrally by the NHS and other bodies to ensure that the sector continues to meet the needs of the modern NHS and, more importantly, of individuals. A key policy has been to ensure people have the choice to either access pharmacy services online, for speed and convenience, or face-to-face at one of a network of high street pharmacies for the personal touch. The great thing is that new technology can help make services more flexible, such as a new facility called Summary Care Records. In fact 96% of the population (55 million) in England have an SCR, which is a short summary of the records held by a GP and, with the individual’s permission, other healthcare professionals may view the summary to improve or safeguard the treatment. For example, if buying an over the counter medicine, the pharmacist may wish to check if it is suitable for use with other medications a person may be taking. Or they can check the record if there are queries on a prescription, which would previously have meant contacting the doctor and would often lead to long delays. If a patient is away from home, on holiday perhaps, and has forgotten their medication, the pharmacist can view person’s SCR and issue an emergency supply with confidence. If a person suddenly becomes unwell when out, a pharmacist can check their SCR and pass the information to the ambulance crew to ensure they are given the best and fastest treatment possible. Permission to view a SCR will be asked for on every occasion, so regular customers can ask for extended permission lasting no longer than a year. This extended permission can be withdrawn at any time by speaking to the pharmacy. If a patient prefers not to have an SCR, their GP can resolve this. A GP can issue a prescription electronically to a chosen pharmacy (a nomination). Nominations can be made at the surgery or chosen pharmacy and are available from almost all doctors. In August this year, 83.1% of GP surgeries used this service. GP practice and pharmacy staff are only able to access electronic prescriptions through personalised NHS smartcards via the NHS N3 spine, a very secure network. The EPS speeds up the process of getting your medicines and allows to greater choice of how your prescription is fulfilled. Remember, how you access services may change but there will always be a pharmacist available for information, advice and support.